In a death bed confession to her beloved granddaughter, Anne Shakespeare (nee Hathaway) relates the secret life she lead after following her young husband to London when their children were very young. Feeling a burden to her parents-in-law in their already too crowded home, Anne set out to help Will with the usual wifely duties, but found—when presented with the props and environment of the theater—she had a talent not only for sewing the elaborate costumes, but also for writing plays. At first she only copied her husband’s scripts in a neater hand. Then she began making subtle changes, and finally, realizing her superior talent, Will began collaborating with her and accepting entire plays written by Anne (though he almost always inserted a few ideas of his own). Always hiding part of her true self, Anne struggles with self-image, her role in life, her desires and her loyalty to others. While she is very open minded and a steady friend and companion, there is always a breaking point which usually leads to another change in her life, and in extension more sustenance for her muse. These very changes lead to her penning her most important works. 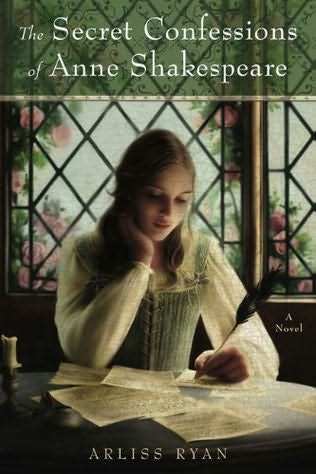 For me the most interesting part of this novel is the timeline and origin of the plays (and Will’s sonnets), as it is done in such a way as to explain why either Will or Anne decided on the themes, characters and topics at the time. It was always a circumstance or event that prompted their ideas, which gives the story substance and relevance. This so intrigued me that I have gone on a sort of Shakespeare kick and purchased a 2 volume set of Shakespeare’s entire works to peruse as well as a biography and another book based on the subject of Elizabethan theater. It feels strange to suddenly enjoy Shakespeare, when I didn’t care for it at all in school, but that just goes to show that a really great novel such as this can change a mind and open a person to further reading. The Secret Confessions of Anne Shakespeare gives yet another spin on the true authorship of the famous plays of William Shakespeare. Many people are convinced that Edward de Vere, the Earl of Oxford, really wrote the plays credited to Shakespeare (there is even a group called the Oxfordians), but this story creates another—perhaps less feasible—explanation of how an undereducated glove-maker’s son became a prolific playwright. There are many famous names and personas to enjoy: Christopher Marlowe, Ben Jonson, Queen Elizabeth I, Bess of Hardwick, and Arbella Stuart (to name a few). Late Elizabethan and early Stuart England are described in detail, both politically and in matters of everyday life. Through many ups and downs Will and Anne persevere—all the way to the end of their life together with a touching scene that explains why Will famously bequeathed her the ‘second best’ bed. The entire book is filled with these wonderful insights and pieces of wisdom. The end of June has wrapped up my mid-year of book reviewing and I must claim this one as my favorite so far! If you’re planning to purchase a new book for yourself soon, this is my recommendation, Shakespeare fan or not!